If you have any Ollies (or Spheros) in your classroom, library, or makerspace, you’ve probably discovered that kids love driving these little devices around. Students love to test their driving skills, which as I’ve witnessed, generally aren’t that good. We have 4 Ollies in our makerspace and, in an effort to have students program the Ollies instead of just drive them around, have created “challenges” for students. 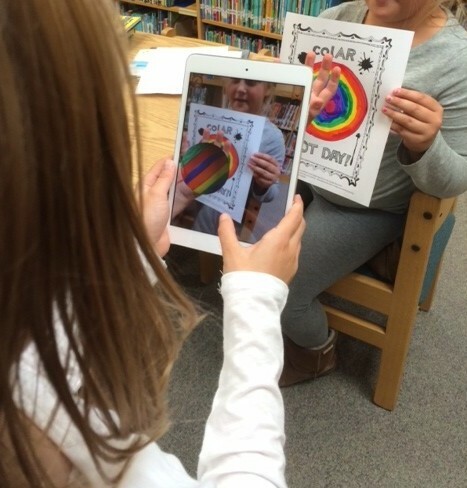 The idea is to have students use the SPRK Lightning Lab app on either a Chromebook or iPad to program the Ollie to complete a certain task. One example (shown below), has the students creating a program to move the Ollie in a square, changing color on each side, and not crashing into anything. When a student completes the challenge, and has someone confirm they did it correctly, they will receive a badge that will be displayed on a poster in our makerspace. If you’d like to take a look at the challenges to use or adapt, feel free. Click to view the challenges and make a copy for yourself if you want to edit them. 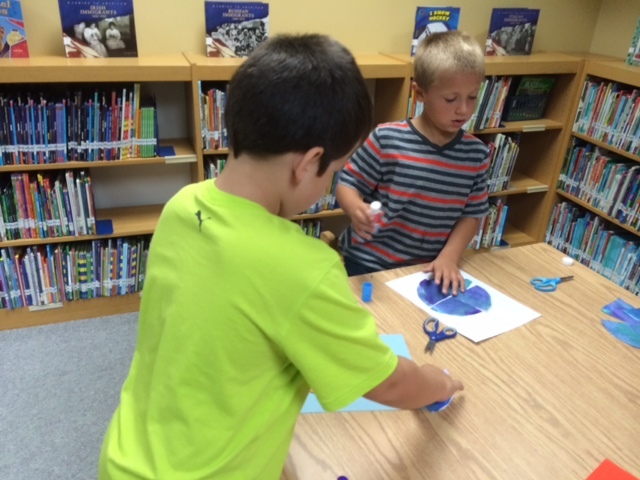 We have plans to create more challenges for other makerspace items soon. I’ll certainly be sharing those as well. Libraries are changing, we all know that. 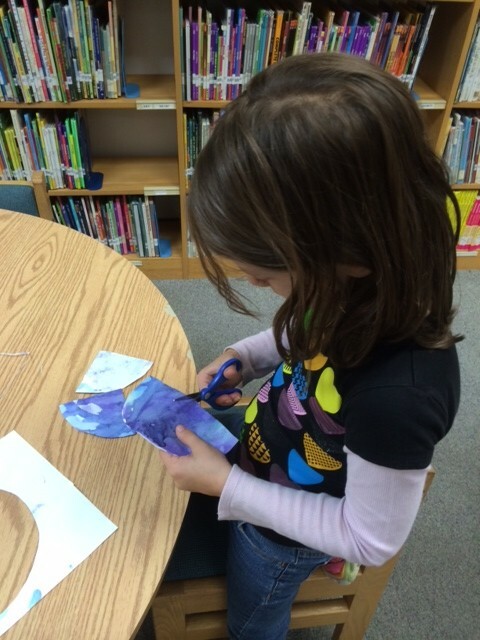 My elementary school library is evolving and we are looking for ideas to transform the space. Many school libraries are going through similar changes and it’s great to see. At the ICE Conference in February, I attended a session that shared a complete renovation of a school library and it looks amazing. Here is the slide show shared during the presentation. Recently, I participated in #tlchat, a Twitter chat for teacher-librarians and the topic was Rethinking Library Spaces and Learning Space Design. It was a great discussion and many people shared great ideas about what they have done or are looking to do in their libraries. If you missed out on the chat, here’s the transcript. The discussion got me thinking. There should be a place where teacher-librarians can share images of their library spaces, especially updates and new designs. It should be simple for people to upload pictures and easy for people to view. It doesn’t appear that this type of virtual photo album exists so I decided to create one. I went through a few ideas, checking with others to see what would work best and finally decided on a shared Google Drive folder. I hope this folder can be an inspiration to others looking to make any changes, big or small, to their library space. We can never have enough good ideas so please share share share! 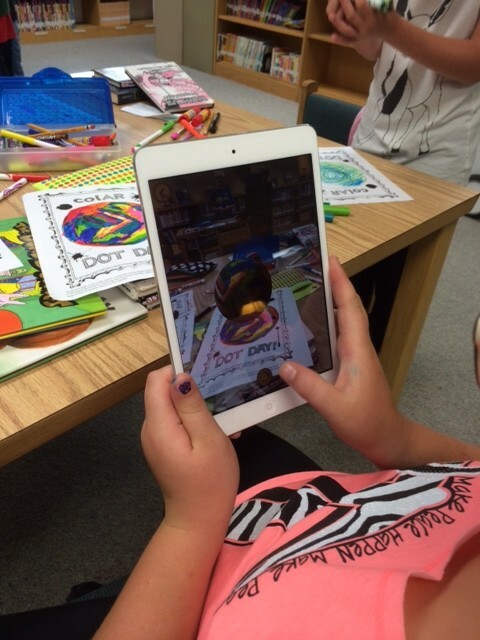 To add your own images, go to http://tiny.cc/schoollibrarypics and click on “Add to Drive” in the upper right-hand corner. From that point, upload any images to the folder as you would any other Google folder. In my role as library media specialist, connecting what I do with the classroom is essential. A lot of people talk about the changing role of the school library and the idea that the school library being the hub of the school. I agree with all of these ideas, but making it happen isn’t easy. This needs to be a common goal for everyone involved – from the library media specialist to the principal to the classroom teachers to the library aides. When everyone is headed in the same direction, progress can be made. Changing the physical space, including the furniture is not an easy, or inexpensive, task. You can paint, create fun spaces within the existing room, and develop fun displays to make the space look better for the students. Really changing the identity of the library is much harder. I believe one way to move this process forward is more collaborative work between the library media specialist and classroom teachers. When the teachers, and, more importantly, the students, see the library media specialist as another teacher, great strides can be made. This collaboration may not be easy for everyone, but I like to think of this idea as a 5 step process and one that the school librarian needs to take the lead on. Here are 5 steps to connecting the school library and classroom. PLAN what you’re going to do. This seems obvious, but make sure everyone knows what they are going to do and when. What will happen in the classroom during the project and what will happen in the library. Make sure to include all stakeholders, including any special education teachers. Think about the schedule and anything that could impact the plan. Is there an assembly or day off that changes the schedule? Keep those things in mind. Make sure you connect regularly and adjust the plan as needed. DO the project. It seems simple, but you have to stick to your plan. Don’t let a roadblock stop the project. One great thing about teaching is the idea that if something doesn’t go as planned, you can make adjustments and keep going. Don’t let the project get shoved to the back burner. SHARE what you’re doing. Throughout the process, let others know about what’s going on. Keep parents informed, other teachers, and the world. Blog about it, post pictures and video clips to social media, and spread the word any way possible. You’ll get great feedback and probably tips and suggestions along the way. Don’t keep what you’re doing within the walls of your school building. REFLECT on the project. Meet with everyone involved and discuss what went well and what needs to be adjusted. How will you make it better next time? This is very important and while I do believe teachers reflect on their practice, put these reflections in writing. Collaboration isn’t easy. It takes work. The library can become an, even more, essential part of the school, and everyone can view the school librarian as a teacher. To head in the right direction, the library media specialist needs to be a leader. Take charge, reach out to classroom teachers, and work together. The change to a more collaborative relationship can work. Today was a very fun day in the library. We started celebrating Dot Day today and I had 4 classes, grades one through four today. Here’s what we did. First Grade – After watching the archived livestream of Peter H. Reynolds reading The Dot, an event I was fortunate enough to be a part of in 2012, students used the Paint program on the computers to create their own dot. One of the cool things about the computers we have in our lab is that they are touch screens. This made drawing and coloring the dots much easier for the younger students, compared to using the mouse. We saved their dots and I’ll be putting together a slide show of their work soon. The dots were printed out, the students signed them of course, and they took them home. Second Grade – These students did the same thing as first grade, but actually had another option for drawing their dots – they had the option of using a stylus for their drawings. If you’re wondering why the first graders didn’t have this option, it’s because I didn’t know we had them. They are actually hidden in the monitors and a fellow library media specialist told me about them. 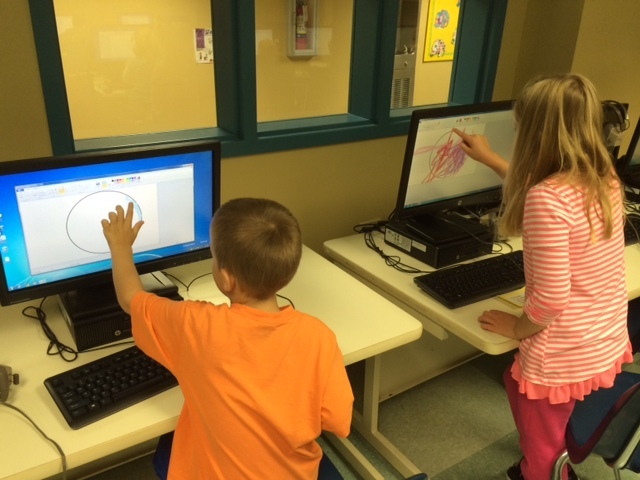 These students had the option of using the mouse, their fingers, or the stylus for their dot drawings. Fourth Grade – After watching the reading of the story, fourth graders grabbed their markers and were told to color their dot on a special piece of paper. They didn’t realize their dots would be coming to life. 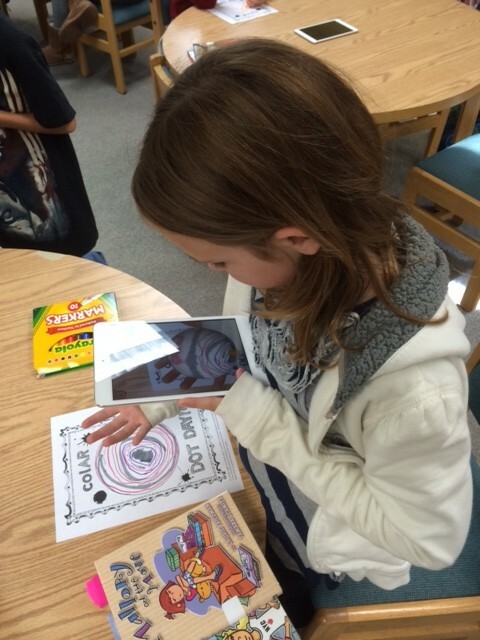 Using the colAR app, students were able to use an iPad or iPod Touch to spin and rotate. They loved this and many even decided to create a second or third dot. They were excited to go home and download the app and show their parents. Overall, it was a great day. More classes will be doing similar activities in the coming days, but the kids loved it, as did I. Change can be good, bad, scary, and exciting. I’m sure there are many other words you can think of to describe change. Changing the kind of coffee you drink or the route you take to work is a small change. Moving houses or making a job change is much bigger. Regardless, change breaks up a routine that can impact many people – in ways you can anticipate and in ways you cannot. I tend to believe that change is usually good. It opens up new opportunities, new experiences, and new ways of thinking that probably wouldn’t happen if the change isn’t made. I’m making a change. A big change. A fairly sudden change. I have recently resigned from my position with Discovery Education to return to the elementary school environment. I’ve accepted a position in a new district, a DE using district, as the library media specialist/tech integrator/computer teacher/whatever else you want to call this position. There was a lot of thought that went into this decision, this big change, but I’m happy to be back in a school, impacting students and teachers. I loved my time with the DEN Team. It was fun, challenging, exciting, and ton of other synonyms for awesome. My team consisted of the best people, many of whom I consider very good friends. I’m looking forward to continuing those friendships on a slightly different level now. I cannot thank Lance, Porter, Steve, Dean, Kyle, Jannita, and others for such a fantastic (almost) 3 years. Words can’t really express how I feel about the team. I know things are going to be challenging for them for a while, but if anyone will continue to rock, it’s that team. The educators we’ve worked with, many of whom were my friends before joining the DEN Team, are people that I can continue connecting with to share resources, ideas, and laughs. The new connections from this year’s DEN Summer Institute and other events are just as valuable. The DEN is truly a family. I love the fact that I can travel the country and know great people all over the place. If I head to Southern California, where I’ll be in a few weeks for vacation, I can hang with Brandon and Dennis. If I head to Texas, I can visit Howard in Austin or Kristy in Houston. If I go to Knoxville, I can stop and see Tim, as I did this past May. If I head to Canada and am in Saskatchewan, Lindsay and Dean will say hi. I can’t forget about the various Pennsylvania folks as well. I know many of you who’ve been connected with the DEN have similar connections and know exactly what I’m talking about. I cannot wait to connect the students from my new school to my friends across North America. Over the almost 3 years working with the DEN, I heard about all of the great things happening in schools and classrooms across the country. Teachers are doing amazing things. Hearing about all of this is very exciting, but somewhat frustrating as well because I have been unable to do these things myself. I almost felt like I was falling out of the loop a little. Prior to joining the DEN team, I could implement these ideas in my school with the students I worked with. Now, I’ll get to do it again, and this excites me. This is ultimately what’s driving this change. This is a big change, but one I’m anxious for. It’s certainly going to be different – for me and my family. My commute will be different because I’ll actually have one. My schedule will be different. My coworkers will be different. However, there’s one thing that won’t change, my connection to so many awesome educators. It’s been about three months since I left my job as a library media specialist to join Discovery Education. The move for me has been wonderful and I’m not looking back. However, I’m very worried about the library program that I left. When I left, the plan was for one sub to take the position for about three weeks until another would take over for the rest of the school year. From my knowledge, neither had any experience in a library or was certified. It turns out the first one person didn’t make the three weeks because she had to fill another position in the school due to a maternity leave. I’m not sure who filled in prior to the “rest of the year sub” taking over. When that sub took over, I figured there would at least be some stability the rest of the year. I was wrong. Apparently, when there was a need for a sub in a classroom, the library sub was pulled into a classroom and a different sub was put in the library. So much for continuity. But that’s not all. Recently, I found out that there were some issues with one of the classroom teachers and the library sub has been moved into a classroom for the remainder of the school year and the first year struggling teacher is now in the library. Not good. Things brings me to a couple of thoughts and a question. One, the library is not valued in the school. Maybe it wasn’t when I was there, but it seems that it’s pretty much being dumped on now. Two, the staff must not care or they would be speaking out about it. I left plenty of information about library procedures as well as my contact information, but was only contacted once about a problem with a subscription purchase. Should I even care about what happens there anymore? I’m no longer a part of it. Should I offer to help get things straightened out a little or just leave it alone? Part of me wants to care and part of me doesn’t.